Real estate marketing is a funny thing, especially real estate email newsletters. I get hundreds of email newsletters from agents every year and most of them are WAY off the mark as far as good marketing practices and just plain old sales techniques. Basically Danielle is doing everything wrong from her subject line, to content to delivery method and we are going to go over all that and make sure you know WHY they are all wrong and WHAT to do to make them better! As you can see from the picture, the subject line of the email was “newsletter”. Now that is factually correct, but doesn’t really give me a reason to open it other than that I like Danielle and am on her list. I have seen other subject lines such as “Monthly News From The Irish Realtor” or “Jason Lee’s Financial Newsletter”. Each month (or week) the same email subject line. Yawn. What happens when you send the same email month after month, your readers get fatigue and stop being excited to read what you wrote. So what are some good email subject lines? Check out these “SPOOKTACULAR” properties – Lori Crawford, Trinity Realtor, has a sense of humor and sends out the best real estate newsletter email subject lines. She reports that people email her back with funny comments and she has even had showings because people looked at her listings, imagine that! Pinellas Home Prices Take A Nosedive, What is the market coming to? – we are going to talk later about market statistics BUT if you lived in that county, town or subdivision, wouldn’t you be interested in knowing what that is all about? You could add a “call me for a free CMA” to get even more out of the news! Want to know how many homes sold in Denver last month? You get the drift. All of these headlines are a REASON for me to want to open the real estate email newsletter BEYOND the fact that I like the agent. Using these kinds of teasers will increase your open rates and make doing that newsletter less boring because you know that people will be reading. 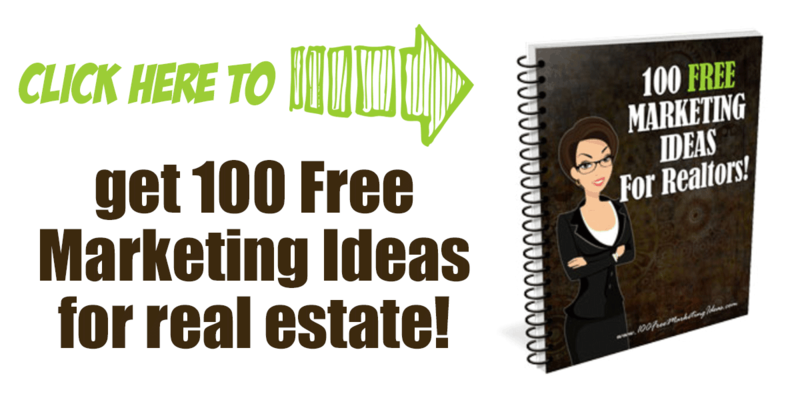 Most real estate agents want to use what is easy to send their newsletters, whether it is effective or not. Database companies like Top Producer, Wise Agent and MyRedTools are not set up to be email newsletter distributors. Their skills lie in being REALLY good contact databases. If you are going to take the time to write a great email newsletter I STRONGLY recommend that you pick a true email company like Mail Chimp to do your mailing. Their ONLY job is to send email newsletters and they are very good at it. They make sure that they stay off of blacklists and that your messages will get delivered. Now, it does mean another $20-ish going out a month BUT that is just a cost of doing business. Trying to jury-rig something that is good enough is a waste of time and energy if the emails never get delivered. 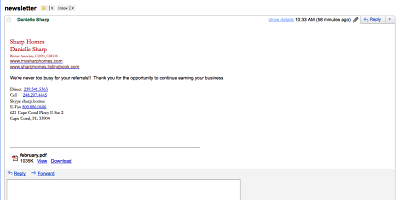 Additionally, they send out HTML emails (the pretty ones that open up right in your email client). Danielle resorted to sending a PDF of her newsletter. Now I don’t know about you but I have heard HUNDREDS of times not to open up attachments, so she might lose some people there. I also am super busy and tend to just glance at a message to see if it would be something I would want to read, she would lose those people also as they probably don’t have to time to download and open a PDF (if there is anyone reading this who is NOT super busy I have some work that I would like to offload on you!). This is a HUGE bone of contention for me! 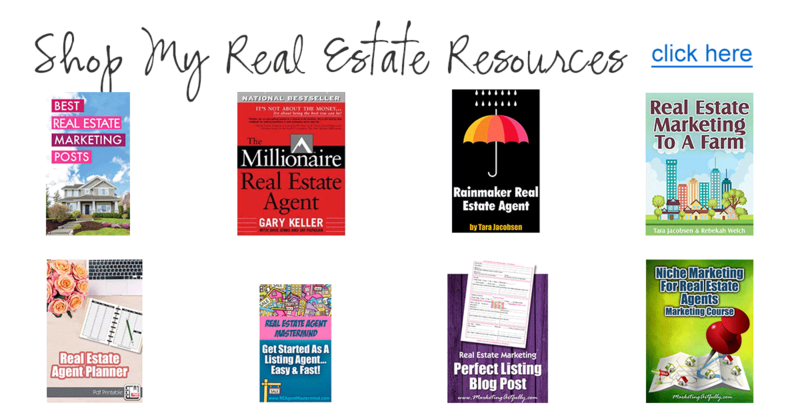 Real estate agents LOVE to send out recipes, health tips and other such fluff in their email newsletters and I contend that they should stick to real estate and home related topics because they are not chefs or Martha Stewart. Danielle said that she was still going to have a section for fun stuff she found that was not real estate related – can’t win them all! So what should you talk about in your newsletters? Market statistics – EVERY MLS on the planet publishes last months market statistics. How many homes sold, how many condos, what the median price was, etc. Make a nice format for these types of things and then send them monthly with a little overview from you about what they all mean. You can talk about seasonality to sales, absorption rate, all the things that you know and never let the world hear! FAQs – Your email sent mail folder is FULL of questions that you have answered for prospective sellers and buyers. Include the question and answer to one of these a month. Featured Clients – People love to read about other people! Write a case study about that first time homebuyer you just closed or the short sale couple you helped. This is called social proof and makes people want to work with YOU rather than all the other agents who send newsletters. Articles about the mortgage market – you can even get your mortgage guy or gal to help with some of the content! There are literally HUNDREDS of things that you can mail out. Oh, oh, oh, if you have a blog, why not post a blurb about recent posts with a link to the article. Drive to web baby! AND if you have Facebook, Twitter and YouTube, links to those go in the template of the email also. There you have it, my rant about real estate email newsletters! If you have any other good suggestions, let me know! 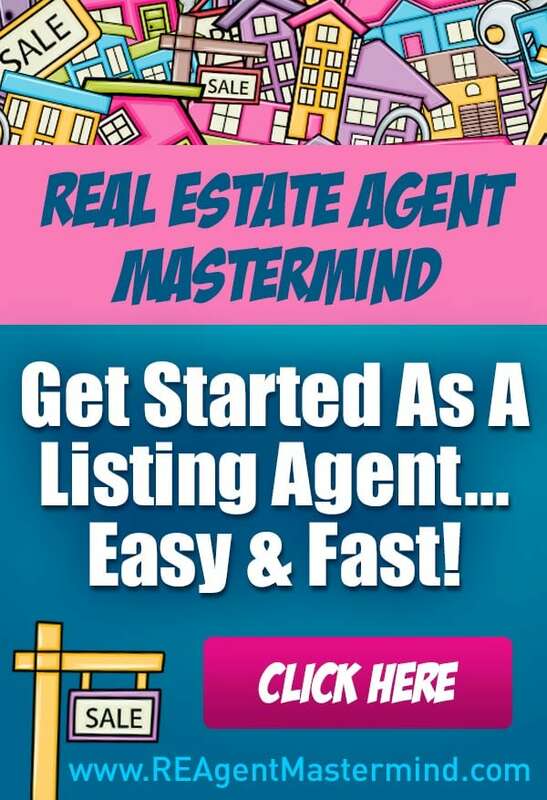 Disclaimer – there IS an affiliate link to constant contact and a couple of gratuitous links to real estate agents I think are doing a good job!